Do You Really Have it Covered? Home / Ask Listen Retain / Do You Really Have it Covered? Does that sound familiar? Have you heard yourself give just that kind of answer when someone suggests looking into a new customer survey system? Did you find yourself thinking, been there, done that, and didn’t get much out of it? Are you ahead of the game, or are you just reacting? If you find yourself trying to close the barn door after the horses are already out, you’re reacting, and you’re doing it pretty late in the game – maybe too late. mart managers take action to identify trouble before it happens – and to prevent it. Does your survey include a good plan of action, or is it all analysis? Even the best survey isn’t going to do much good without any recommendations. If all you get out of your client satisfaction survey is that things are bad, without any plan of action, or even a set of suggestions for customer retention programs , then you probably aren’t going to be able to do much with it. A good survey system should also give you a good plan of action. Can you take effective action? Is your company capable of carrying out a survey’s recommendations for customer retention management , or are even the best and most effective recommendations going to wind up gathering dust on a shelf, because there’s no system in place (or no willpower) to put them into action? A first-rate survey system will also be a first-rate system for response – one that naturally leads your company directly from a plan of action to effective implementation. If your answer to all three of these questions is anything short of a loud, confident “Yes!” then it’s time to consider switching to a more comprehensive and more effective survey system. 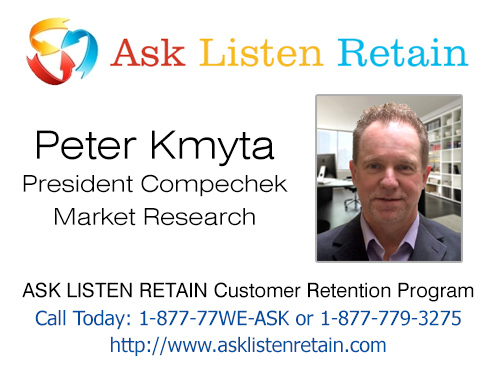 The ASK-LISTEN-RETAIN system is designed to to sniff out potential customer-relations trouble before it becomes a problem. Its in-depth analysis automatically generates a comprehensive plan of action that is directly tied into ALR’s built-in system of response. And in turn, that built-in response system automatically prompts individual store managers to take care of each customer’s problem – and it monitors each manager’s actions, notifying higher managers of individual managers’ responses (or failure to take action). Then you’re talking about real customer response!